verd de gris » Roma Celebration! ← Music Sets Us Free! Past travails and struggles have led to a closely-knit but guarded Roma community in Halifax. Stanislav Fako, who helped set up the Halifax Roma Group, was our first point of contact and it was through Stan that we were able to form a close working relationship with Pavel Botos. Pavel is the de facto leader of the Roma community in Halifax, speaking at public events and advocating for tolerance and understanding for Roma across Europe. The early work with Pavel formed the basis of development work in Sowerby Bridge High School with a group of 14 young Roma students. Sharon and Natalie from verd de gris ran series of creative workshops with this group – the aim was to give them chance to speak from their hearts about their experience of being Roma here in UK: what did their culture mean to them? Could they express a Gypsy Roma ‘identity’ with their peers? This was very sensitive and very difficult work – these students feel strongly about their situation: that people “look down on them”, see them as “ugly” and that they “felt scared to tell people they were Gypsy”. They were naturally cautious and reticent about opening up to a “White women”. The key to the success of this element of the project was the relationship Sharon had developed with Pavel. This meant she could share a depth of knowledge and “understanding” about Roma culture and the problems the young people faced. She was able to use this to encourage the students to share their remarkable creative talents with the rest of the community (and with their peers) at a celebration event and at a Year group assembly / discussion at the school. Verd de gris supported Pavel and the community to stage a celebration event with our partners, Square Chapel Arts (including a 3-piece Roma choir from Cardiff). Natalie, Sharon and musician Amy-Rose also developed a short project with Burnley Rd Academy, showing them aspects of Roma culture and taking Pavel and Stanislav into the school to meet the children. The children devised a performance piece with Natalie to offer as a cultural exchange at the celebration event at Square Chapel. The event at Square Chapel attracted an audience of over 200 people to see and hear the Roma tell the history of their rich culture. Senior officers from Calderdale Council, community development workers, teachers and many children from a diverse ethnic and socioeconomic backgrounds were in attendance. 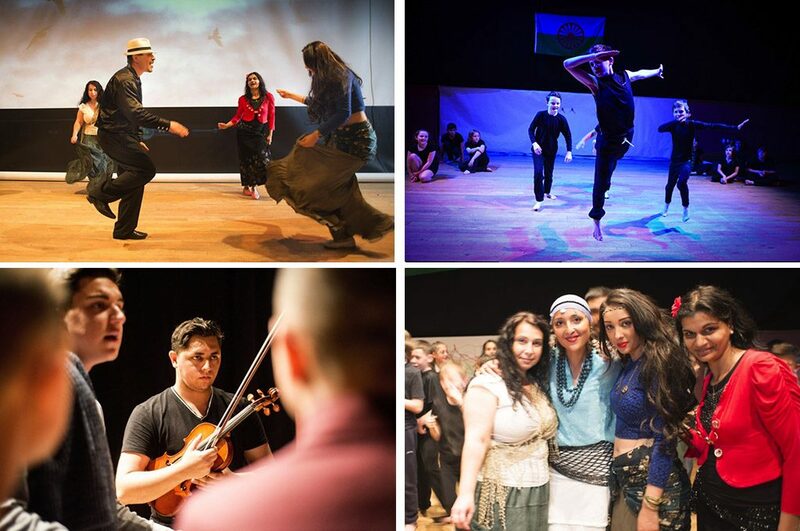 The event was fabulous, and a true reflection of the energy and spirit of the Roma people.